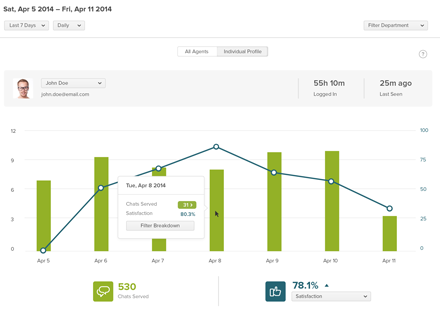 Analytics displays a series of reports, giving you an overview of your chat and agent activity. With this data you can optimize your customer support strategy and improve its efficiency. The Chat Reports tab displays information on all the chats in your account. The Chat Stats graph lets you compare the volume of chats with their timing trends, on an hourly, daily, or weekly basis. Determine your busiest periods by observing visitor wait times, response times, satisfaction ratings, acceptance rate, and the number of chats served and missed by your agents at any given time. 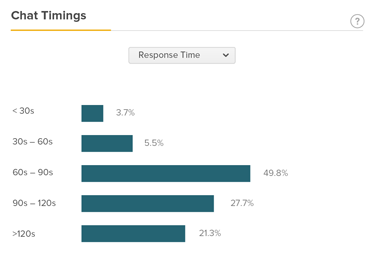 The graph includes a stacked bar chart with all served and missed chats, giving you an overview of your agents chat load in any given time period. Note: Wait Time (Served) shows the same results as First Response Time in the CSV. This means you will see the time it takes for agents to respond to initial chat requests. Next to each metric is an up/down arrow comparing the currently selected period with the previous one. For example, if your currently selected period is Last 7 Days, then it will compare the number of served chats, missed chats, and your chat timings with the previous seven day period. 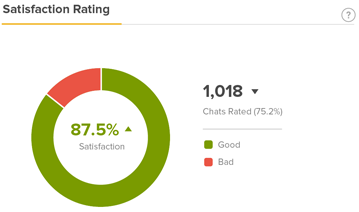 The Satisfaction Ratings section shows the percentage of chats rated Good and Bad for the given time period. Click on either portion of the graph to see Chat History details for chats with that rating. The Chat Timings section shows you chat response times, chat lengths, how long visitors waited before first receiving a response, and the time between a visitor's last reply and when they ended the chat (without an agent response). This graph can help you see if your efforts in improving visitor wait times have had an effect. 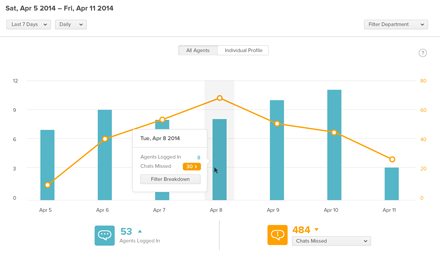 The Agent Reports tab shows graphs of overall and individual agent activity on your account. On the All Agents tab, you can see the number of agents logged in versus various chat metrics. 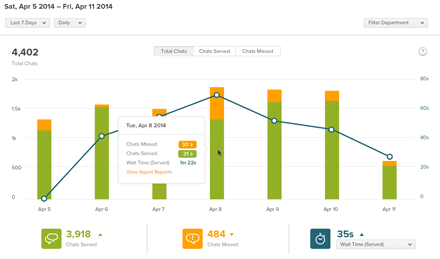 Under the graph, you can also view an Activity Breakdown of all your agents and their chats. Click the Leaderboard tab to see a list of agents sorted by who has served the most chats. You can also click any of the other column headings to sort by that column. Select the Leaderboard dropdown menu in the upper right and choose Agents Logged In, Agents Online, or Agents Serving to see a schedule for each group of agents for the given time period. Note that this feature only shows logged in times to the nearest hour. Note: Agents Logged In data is only available from April 2, 2015 UTC and later. Agents status data is available only from August 22, 2017 and later. Click the Individual Profile tab at the top of the page to see a specific agent's activity, including total time serving and logged in, when the agent was last seen, total number of served chats, acceptance rate, and satisfaction ratings. You can also view the agent's individual activity by clicking the magnifying glass next to his or her name from the Leaderboard. Under the graph, see an Activity Breakdown for the specific agent selected above. Click on the Performance tab to see details on the agent's performance compared with the average for your account, as well as their Logged In, Online, and Serving schedules for the given time period. 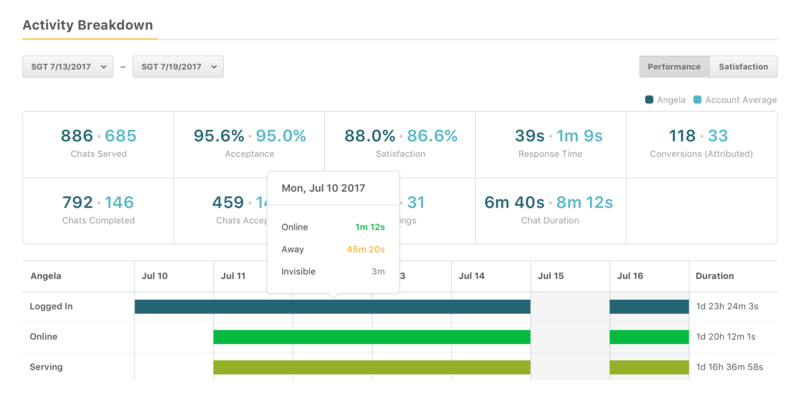 You can also hover over a section of the schedule to view a breakdown of their time in each status (Online, Away, or Invisible). Click the Satisfaction tab to see an overview of the agent's satisfaction ratings and related comments. You can also select a custom time range. Data in the Chat Stats graph can be viewed on an hourly, daily, or weekly basis. Hourly data is limited to a 24 hour period, daily data is limited to 31 days and weekly data is limited to 90 days. The data in all graphs includes the last full day that has passed. For example, the “Last 1 day” hourly data includes the last 24 hours from the the previous midnight. 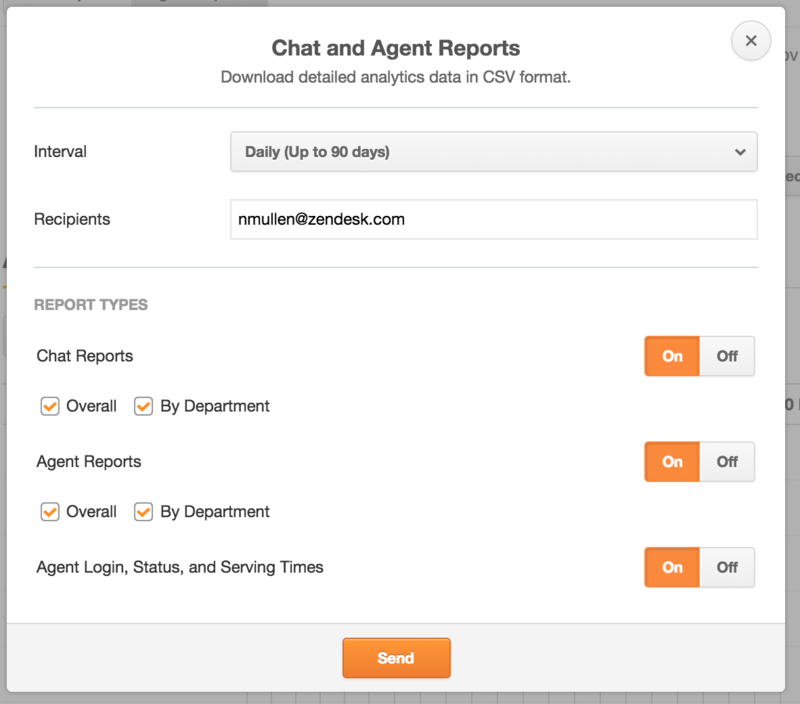 You can export your Chat and Agent Reports into a CSV file. In the exported CSV file, the first row of data will always start from 00:00 of the selected timezone. For details about the metrics that are exported to the CSV file, see the Analytics CSV glossary. Click Download CSV in the upper right-hand corner. Select the reports, date range, interval, and recipients in the window that appears. Emails must already be registered in your Zendesk Chat account. You can enter multiple emails separated by commas. Enterprise accounts can choose to export data by department. You can receive Analytics email reports weekly, monthly, or, for Enterprise accounts, daily. From the dashboard, go to Settings > Personal. Click the Email Reports tab. 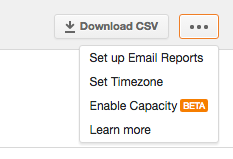 Select the Enable email reports check box. Select the frequency of reports you want to receive. Note: Only Enterprise accounts have the option of daily email reports. Capacity is the estimated amount of chats that can be served by the account in a given period of time. The capacity is a function of the number of agents logged in, the average chat duration of an account, and the chat limit set by the agent. 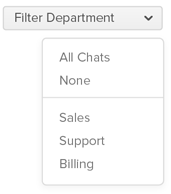 Under Agent Reports > All Agents, you can compare capacity with total chat volume to get a sense of how over- or underutilized your agents are based on your current chat routing settings. For details about chat routing, see Setting up Chat Routing. Currently, the beta version of capacity is in beta is based on your current chat limit. From the dashboard, select Analytics. Click the ... menu in the upper right corner. Hi there! Is there a way to see, or create a metric that shows an individual agent's AHT or Total Time Spent in chat? We are 24/7 and I believe we will have multiple agents on a single chat, so we need to know how much time each individual agent spent on a single chat that is shared with other agents. These reports are pointless as they are all generated in UTC. It needs to be in our account time-zone. I agree why are these reports sent at 4pm only? I assume this is the US timezone for these reports, which are useless. I need them daily for reporting activity for the previous day. And having them by the afternoon is useless. Hi there, I agree with Maggie. AHT is vital for our QA department when assessing agent performance (KPI). Is there anything Zendeck can offer us as a solution? As it stands, if I am a customer and I spend 10 min Online and then only come to chat, how can we determine if the chat to 5 min to resolve or 15min? Here too this is very difficult to determine how long each agent worked on the chat. James had a chat regarding a refund, he spends 7 min working with the customer to resolve it. In the end, James transfers the chat to Finance. Finance spends 5 min and resolves the issue. The total time spent on the chat was 12 min. Now for us, if an agent spends 12 min on a chat...... that raises a question WHY. But if I can see that 2 agents worked on the chat 7 and 5 min respectively. That would make a world of a difference. We've started diving deeper into our analytics. The data, which appears while the chat is live in the Recent Website Activity of the Home area, doesn't seem to be available after the chat has been served, nor in the history nor in any stats that we can find. Please tell us where to find this! I do not believe we have a way to pull in this activity to be reported on directly (as the recent activity feed). However, I do know that each of these things can be reported on individually. Chat Analytics should give you a break down of your chats and chat activity by agent. Which would therein allow you to report on these on an individual level. These would be under agent reporting, chat reporting and individual agent break downs respectively. I do want to apologize for the inconvenience, but I hope this answers your question! Is there a way to configure the fields in the department_agents_chats_analytics_* csv download file? I'm trying to get the Response Time (sec) and First Response Time (sec) raw value but only see the average, maximum, and minimum values.